The Islanders have signed four-time NHL all-star and three-time United States Olympian Bill Guerin to a two-year contract. 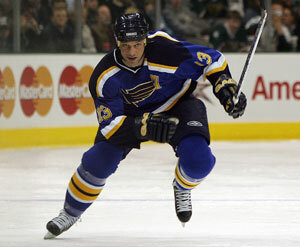 The 36-year old Guerin is coming off a 36-goal season with St. Louis and San Jose and has 364 goals and 355 assists for 719 points in 1,026 career NHL games. "My family and I are so happy to be coming to Long Island," said Guerin. "Garth Snow first contacted me on Sunday and was so positive, so persistent right from the outset explaining to me why I would be ideal for his team. Ownership's commitment to winning at almost every cost and Garth making it clear to how determined he is to build a winner is why I'm an Islander today." Said Snow: "Bill Guerin, by everyone's account, is the consummate professional, the ultimate teammate. And beyond that, he's an outstanding hockey player coming off a 36-goal season. The Islanders are extremely proud that Bill has made the decision to come to Long Island." Guerin has played on the United States Olympic Team in 1998, 2002 and 2006 and in the NHL All-Star Game in 2001, 2003, 2004 and 2007. Stay tuned to newyorkislanders.com and ISLANDERS TV for more on the arrival of Bill Guerin to Long Island and potential additional news out of Islanders Country today and beyond.